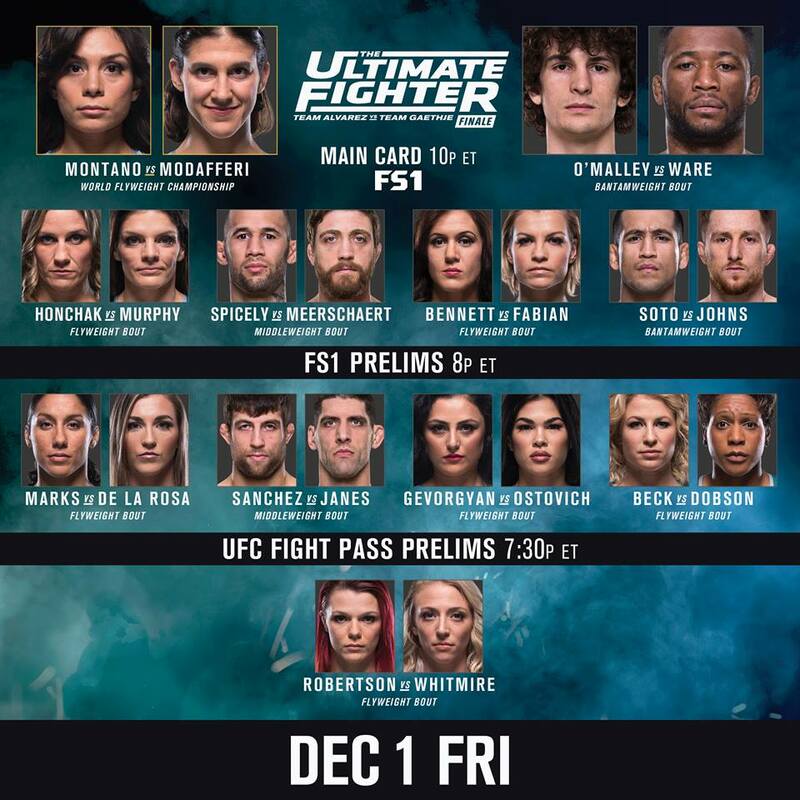 The UFC’s inaugural women’s flyweight champion will be crowned tonight at the TUF 26 Finale. The fight card takes place at the Park Theater in Las Vegas, Nevada, December 1 and culminates the season of Team Alvarez vs. Team Gaethje. Ultimate Fighter Season 26 finalist Sijara Eubanks struggled all season long to make weight. Yesterday proved no different as Eubanks had to be hospitalized and withdrew from the championship bout with Nicco Montano. The main event featured Montano taking on Roxanne Modafferi. Eubanks beat Modafferi to earn her spot in the finale, but with her withdrawal, Modafferi moved back into the tournament and looks to earn a six-figure UFC contract with the UFC, and the belt. This fight would go all five round with Montano winning a unanimous decision and becoming the first ever UFC women’s flyweight champion. Lauren Murphy who weighed in as an alternate would now face Modafferi’s original opponent, Barb Honchak. This exciting fight would go to a split decision with Murphy coming out on top. Head coaches Eddie Alvarez and Justin Gaethje will face one another tomorrow night on pay-per-view at UFC 218 in Detroit, Michigan.